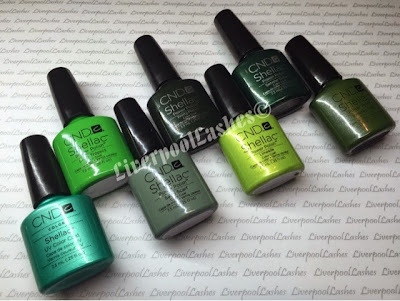 As green is typically a colour that many shy away from, we decided to focus on using the various Shellac shades. I do think it can be difficult to get some clients to try it but certain shades such as Sage Scarf may be a good one to start with as its a muted shade so it's a little more subtle. I'll run through what we used for each design, from left to right. Sage Scarf, Black Pool with a champagne coloured foil. 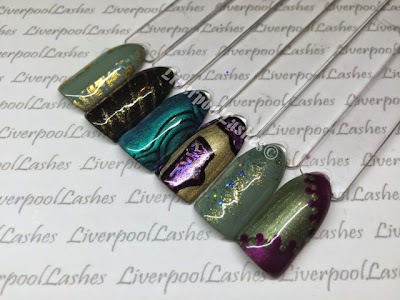 The 'stone' in the centre is a mix of CND Additives in Gilded Gleam, Emerald Mirage and Shimmering Silver. 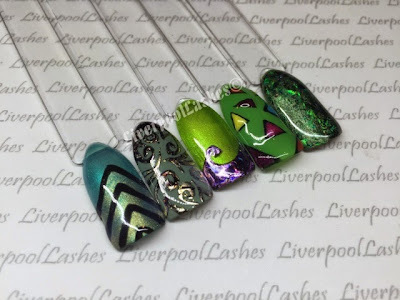 Pretty Poison with blue, lilac and green foils over it in a diamond shape. Hotski To Tchotchke with Black Pool design, foil over. The gem is CND Additive in Deep Blue with Shimming Silver. Lush Tropics and Bicycle Yellow. Serene Green with green foil in a diamond shape. Sage Scarf with Hotski To Tchotchke over it, a strip of Locket Love and Black Pool. Sage Scarf with African Jade foil down the sides. Pretty Poison with a mix of CND Additives in Gilded Gleam, Emerald Mirage and Shimmering Silver. Pretty Poison with Hotski To Tchotchke over it, carved. Sage Scarf with a mix of CND Additives in Gilded Gleam, Emerald Mirage and Shimmering Silver. Frosted Glen and Tango Passion. 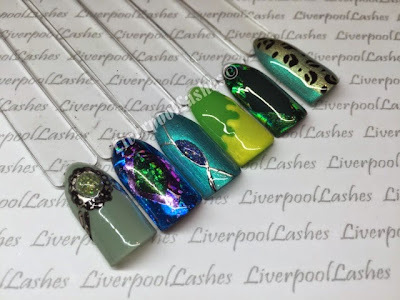 Hotski To Tchotchke with Locket Love and Black Pool. Sage Scarf and Black Pool with a leopard print foil over. Lush Tropics, Bicycle Yellow, Sultry Sunset, Tango Passion and Electric Orange. Frosted Glen with green foil scrunched and dabbed on.